Record numbers of new teachers are leaving the profession within a year of qualifying, according to a teachers' union's analysis of official figures. The latest figures, for 2011, show just 62% of newly qualified teachers were still in teaching a year later, the ATL annual conference has heard. This is a steep drop from 2005 when there were 80% still in teaching after a year, says the union. 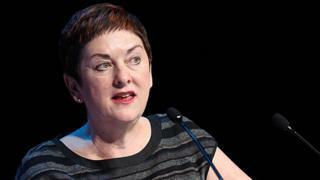 This is a "crisis of teacher supply" said general secretary Mary Bousted. "Teachers are leaving in their first year, or not starting teaching when they have completed their training," said Dr Bousted in her speech to the union's annual conference in Liverpool. "That's almost 11,000 qualified teachers never entering the profession - taking work elsewhere. Work with better pay and reasonable workload." The union's analysis draws on official Department for Education figures for 2011. The researchers added the figures for teachers who left the profession within their first year in service to figures for newly qualified teachers who never actually practised as teachers. The results suggest that in 2011 some 10,800 newly qualified teachers never entered service after completing their training, just over a third (38%) of the total. "Why are we losing the next generation of teachers, that new blood for the profession which should be bright-eyed and bushy-tailed, full of promise and ambition?" asked Dr Bousted. "Is it, I wonder, because trainee and newly qualified teachers see very early on just what teaching has become and decide that they do not want to be a part of it? "Is it that they learn as they work with exhausted and stressed colleagues that teaching has become a profession which is incompatible with a normal life? "Trainee and newly qualified teachers cannot fail to understand that, despite Michael Gove's intentions, teaching has become a profession monitored to within an inch of its life." Dr Bousted said fear of the demands of Ofsted had led many head teachers to impose an excessive bureaucratic load on staff, "filling forms, inputting data, using three different coloured pens for 'deep marking' and so on". The increased workload adds "not one jot to the quality of teaching", she said. This exodus from teaching "could not happen at a worse time", said Dr Bousted. "We need our teachers and lecturers now, more than ever, if we are to face the challenge of change. "A tsunami of curriculum and qualification changes threaten to engulf schools and colleges as Ofqual, the qualification agency, marches on - leaving dismay and devastation in its wake," she told the conference. Dr Bousted concluded with a reminder that it is education professionals and not politicians who raise standards. She warned that failing to improve the lives of education professionals risked politicians reaping "the bitter reward of parental fury when there is no teacher for their child". In challenge to politicians to act she warned that this was no threat, but "a crisis of your own making".